Georgia Tech’s Christensen Explores the future. Photo: Robb Cohen. 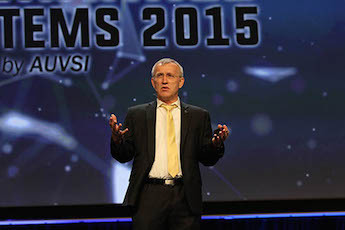 The world is no longer flat, says Henrik I. Christensen, the closing keynote speaker at AUVSI’s Unmanned Systems 2015. Christensen, director of Georgia Tech’s Institute for Robotics and Intelligent Machines, said economist Thomas Friedman’s theory that low wages and cheap transportation means that products can be built anywhere is no longer holding true. Wages are rising in China, and revolutions in robotic manufacturing mean it’s becoming more economical to build products in expensive places like the United States and Europe again. Computer manufacturer Lenovo recently built a factory in North Carolina, Apple built one in Texas and electric car manufacturer Tesla designed its product to be built in California, where labor costs are high, Christensen said. “With advanced automation, we can do this,” he said. A company called Symbotic recently built a 10-story warehouse in Boston stuffed with robots, some of which are moving at speeds up to 30 mph, which opens up new levels of efficiency. Automation will lead to other revolutions in electronic commerce. Christensen said Google is already offering a service in San Francisco where customers can order a product from a local store and a Google driver will pick it up an deliver it for free. Eventually, with self-driving cars, no human would even be involved in that supply chain, he said. Google isn’t offering this service for free. More people are simply ordering things directly from Amazon without researching them on Google, he said, so the search giant needs to get into the fast-growing electronic commerce game to compete with Amazon and foreign competitors, such as Chinese giant Alibaba. Autonomous driving — and eventually even flying — will be a major new growth area, he said. His students at Georgia Tech aren’t interested in owning a car. If they want to pick up furniture at IKEA, they would prefer to rent a truck. If they want to impress a date, they want to rent a Ferrari. “My own prediction for autonomous driving is, kids born today will never drive a car,” he said. Autonomous driving will first take hold off road, on farms, at ports and in mining operations, where safety is less of a concern. But eventually it will make its way to highways, with self-driving trucks and cars. Europe will probably go first, he said, due to the threat of litigation in the United States, so “we’re going to use Europe as a test range for a few years. Then we will start launching” in the U.S.
Three-dimensional printing will also enter the game. “You will have an unmanned UPS truck driving up to your house and will 3-D print whatever you ordered in the back of the truck and give it to you,” he said. Christensen edited a multi-university roadmap of the future of robotics in 2013 and said a new report is underway, due at the end of 2016. He noted that many previous technological projections have been quite wrong, such as when the CEO of IBM predicted that the worldwide market for computers would be four and Compaq predicted that no one would ever want a computer in their home. “We have only sort of scratched the first 1 percent where the applications are, or less than that. … I would say we’ve barely begun the future,” he said.